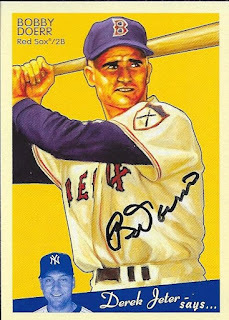 While I was looking for cards to send out for TTM, I found some more of one of the best all-time TTM signers, Bobby Doerr. Doerr, at 97 years old (he will be 98 on April 7), is the oldest living Hall of Famer and the last surviving player to have played in the 1930s. I mailed this 2008 UD Goudey to him on March 4 and got the card back on March 24, for a 20-day TAT. Doerr (b. 1918) played in the majors from 1937 to 1944 and 1946 to 1951 for the Boston Red Sox. He had 2,042 hits, 223 home runs and a lifetime .288 batting average in an era when second basemen were not known to have pop in their bat. Doerr was elected to the Hall of Fame in 1986 by the Veterans Committee. I probably won't send to Doerr any more, since I have gotten him a few times now. However, if any of you are even considering sending TTM to get autographs, I highly recommend trying Doerr. 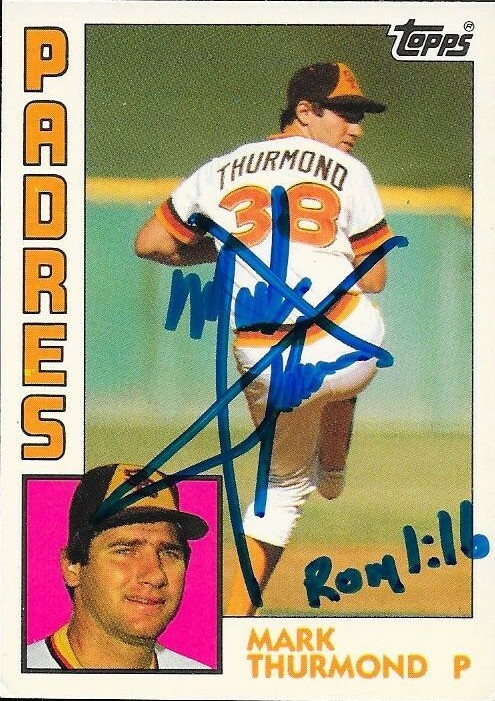 He was the first ever TTM success I got, thanks to a suggestion from my buddy, Drew. You can read about it, here. 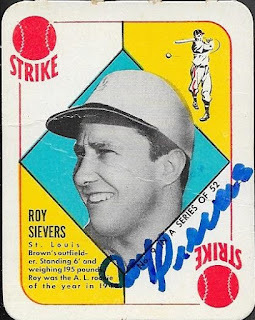 I got a TTM success this past Thursday (March 24) from Roy Sievers that really helped out my Topps Autograph Project. I got a 1951 and a 1952 Topps signed by Sievers, and those were my first from both of those years. The 51 is a Red Back; I have two Blue Backs mailed out, that I hope to see come back soon. I'm really happy about this 1952. I have since received another signed 52, and have mailed out several more. I didn't realize how much I really loved this set. Unfortunately, barring a lottery win, I doubt I will be able to complete this set in my lifetime. Mantle 52, you know. Ouch. 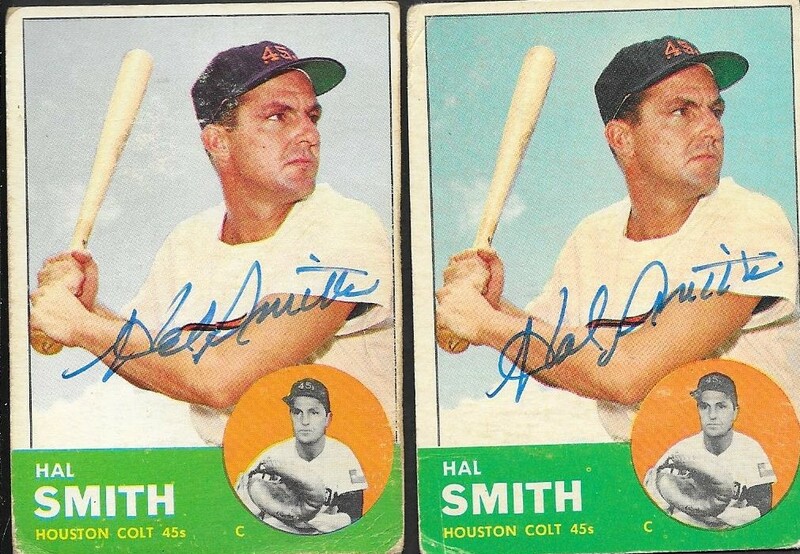 I picked up both of these cards on Ebay and mailed the out on March 15. I got them back with a 9-day TAT. Sievers (b. 1926) played in the majors from 1949 to 1965 for the Browns, Senators, White Sox and Phillies. He had 1,703 hits, 318 home runs and a lifetime average of .267. He led the AL in home runs in 1957 with 42 and also led with 114 RBI. Not your prototypical home run hitter (by today's mold, at least), he never struck out more than 88 times in a season. He finished third in the 1957 AL MVP voting (behind Mickey Mantle and Ted Williams) and was the 1949 AL Rookie of the Year. 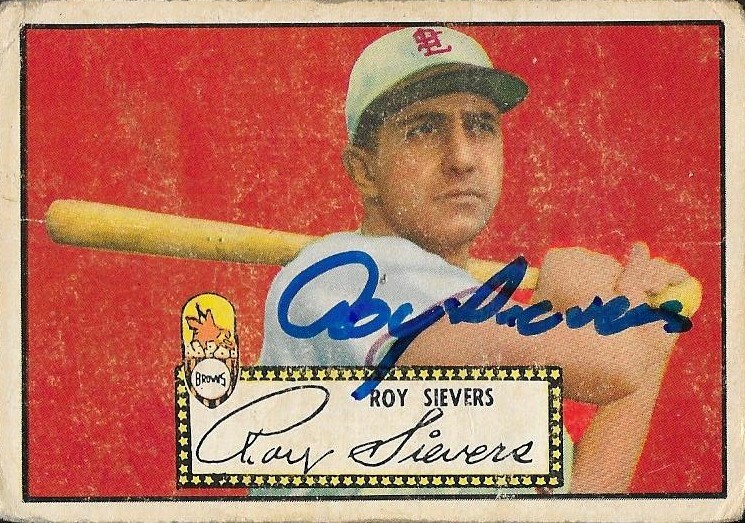 Sievers appeared on the Hall of Fame ballot in 1971 and 1972, but only received a maximum of 1.8% of the vote (1971). This is my second success from Sievers. I received a signed ball from him on August 24, 2011. You can see that post here. 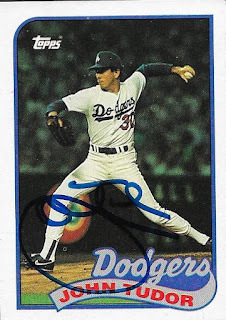 I got a TTM success back from former pitcher, Ron Schueler on Wednesday, March 23. 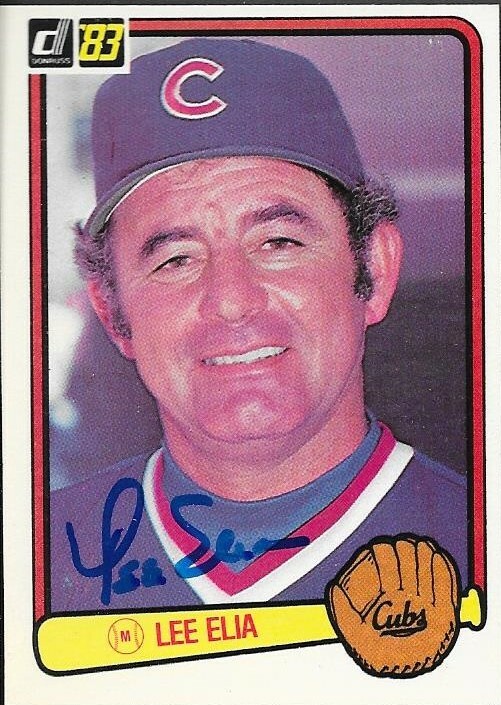 I only had one card of him, this 1974 Topps that came from the old Topps "Cards Your Mom Threw Out" promotion. I had kept the cards that I had shipped from there in a box, still in the top loaders that Topps had provided. Finally, I put a couple of them to use! I really loved that promotion, and I wish Topps would run something like that again instead of some of the dumb ones they did after that (the virtual coins? Blehh). Schueler (b. 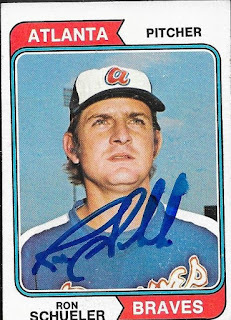 1946) played in the majors from 1972 to 1979 for the Braves, Phillies, Twins and White Sox. He had a career record of 40-48 with an ERA of 4.08 and 563 strike outs. I received this signed card from Schueler 11 days after I mailed it on March 12. 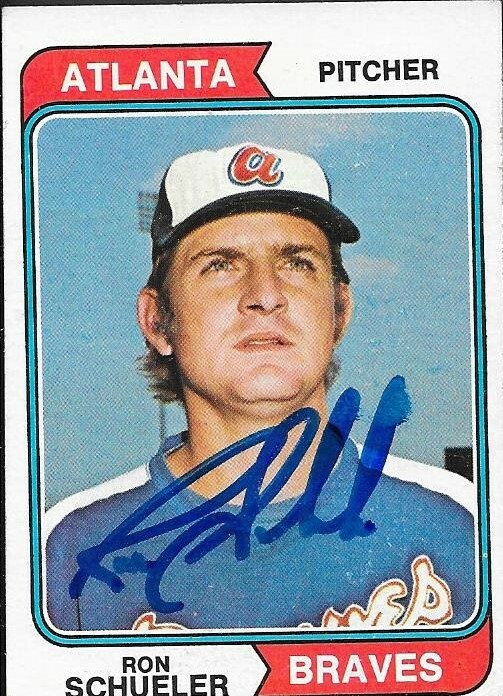 This was the first 1974 Topps that I have gotten signed for my Topps Autograph Project. 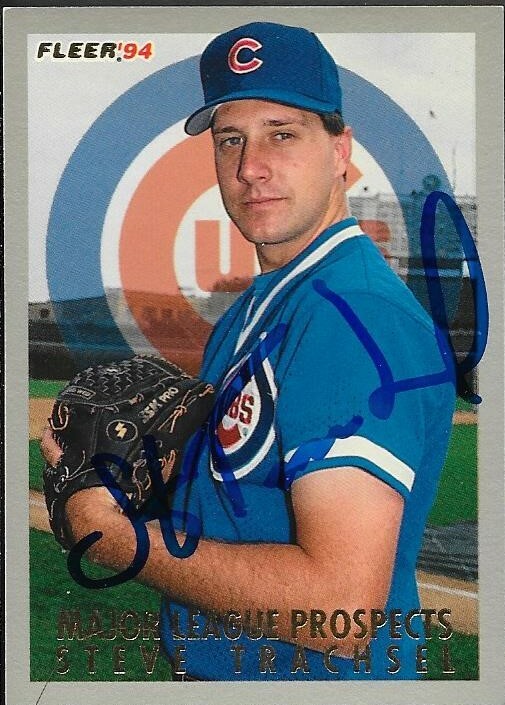 On Wednesday, March 23, I got a TTM success from former Cubs Manager, Lee Elia. 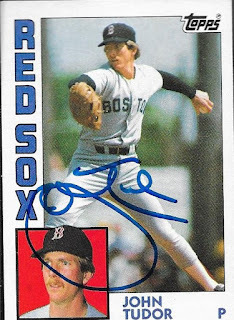 I got two 1983 Donruss cards signed by him that I had sent out on March 2. Elia (b. 1937) played in the majors in 1966 and 1968 for the White Sox and Cubs. He had 43 hits, 3 home runs and a .203 batting average. He managed the Cubs in 1982 and 1983, a stint maybe most memorable for a April 29, 1983 tirade that included a lot of F bombs that was recorded by Chicago beat writers. I thought about posting a Youtube link, but I don't think it is for the faint of heart, or ear, but if you type in Lee Elia Rant, you'll end up in the right place. He also managed the Phillies in 1987 and 1988. Elia was also a bench coach for the Orioles in 2008 under manager Dave Trembley. I only had the two Donruss cards of Elia, but I got both of them back in a 21-day TAT. 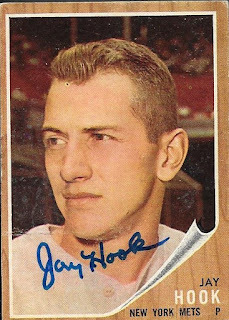 I got a TTM success last Tuesday (3/22) from former pitcher, Jay Hook. I mailed this 1962 Topps to Hook on 3/12 and got it back in 10 days. This was the first 1962 that I have been able to get signed. Hook (b. 1936) played in the majors from 1957 to 1964 for the Reds and Mets. He had a career record of 29-62 with an ERA of 5.23 and 394 strike outs. 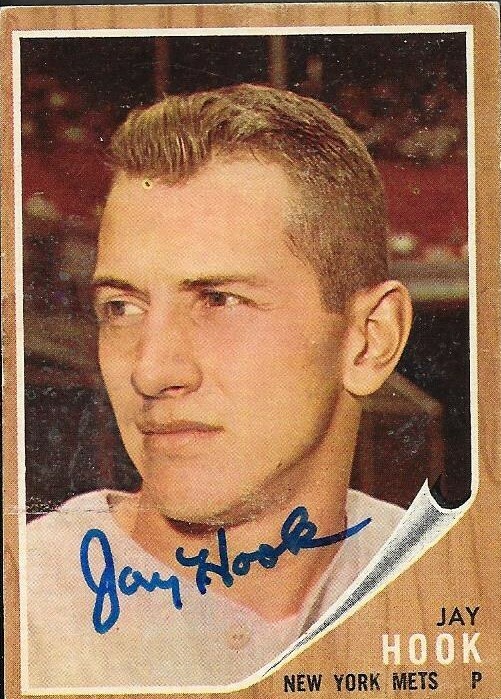 Hook was a member of the inaugural Mets team (1962) that went 40-120 (ouch). Hook, himself went 8-19 for that hapless club. Those Mets were so bad, they didnt win more than three games in a row all season, and they only had the one three-game winning streak. 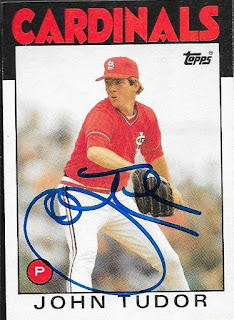 I received a TTM success on Monday (March 21) that I had sent out on March 12 (9-day TAT). 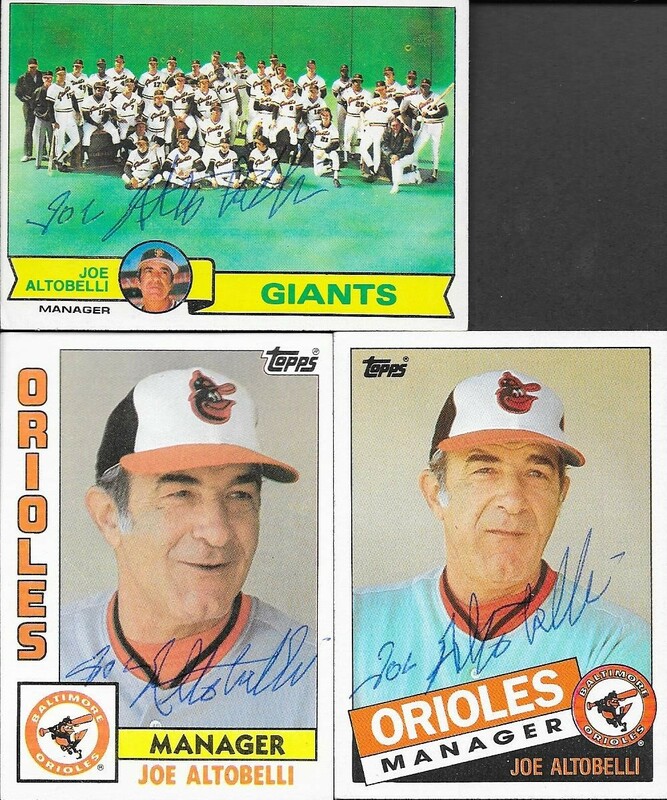 The signed cards were of former manager, Joe Altobelli, who helmed the Orioles to the 1983 World Series title. Altobelli (b. 1932) played in the majors in 1955, 1957 and 1961 for the Indians and Twins. 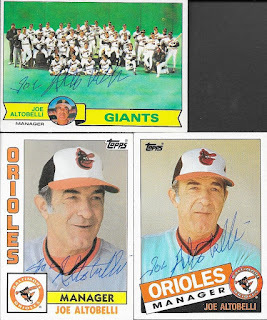 He would go on to manage the Giants from 1977 to 1979; the Orioles from 1983 to 1985 and the Cubs in 1991. His career managerial record is 225-239 for a .485 winning percentage. 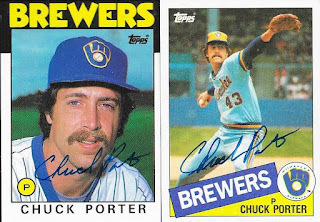 I got a TTM success last Monday from former pitcher, Chuck Porter. I mailed to him on March 7 and got him back on three cards (one was a duplicate 1986 Topps) and got him back on March 21 for a 14-day TAT. 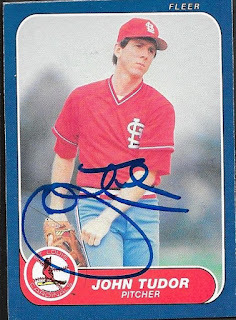 The autos came out great on his cards, with the 1985 looking the best, I think. Porter (b. 1955) played in the majors from 1981 to 1985 for the Brewers. He had a career record of 13-13 with a 4.14 ERA and 136 strike outs. 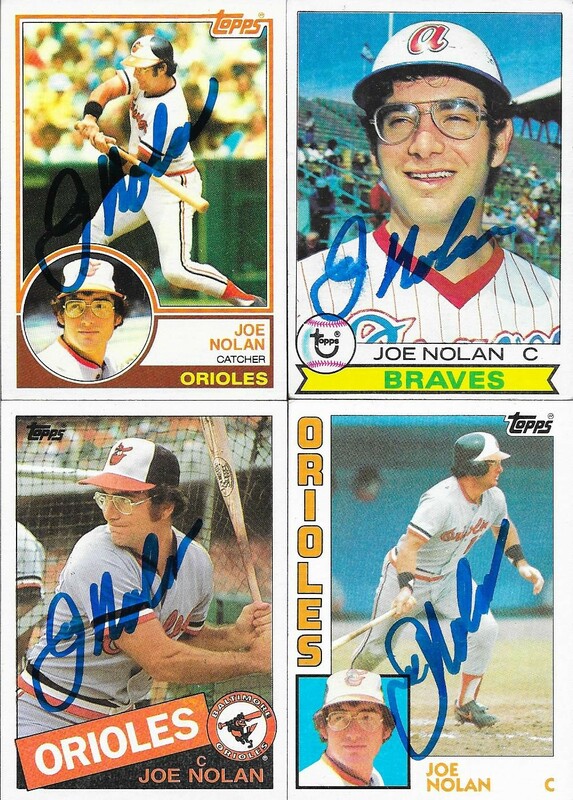 On Monday (3/21) I got a TTM return from former Oriole, Joe Nolan. 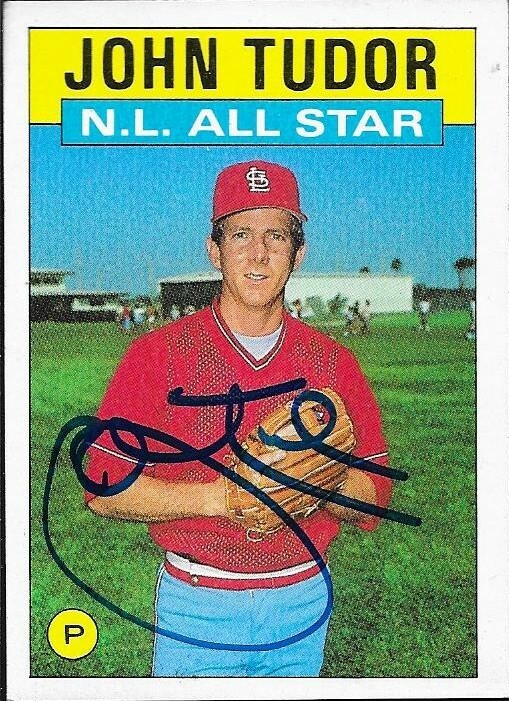 He signed five cards for me (one was a duplicate 1985), which were 1979, 1983, 1984 and 1985 Topps. 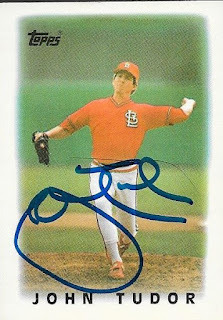 I had asked Nolan to inscribe the 1984 Topps to say "1983 World Series Champions" but he probably didn't see that in my note. It wasn't a big, deal, though. I'm really enjoying seeing all of these different versions of Topps come back in. They all look cool, signed, and I'm having a lot of fun with this project. I've gotten so many returns lately, it has been tough keeping up with the blog posts. I'm definitely not complaining, though. It seems like every day, now, I am getting stuff in the mail. I'm really happy about that! Nolan (b. 1951) played in the majors from 1972, 1975 and 1977 to 1985 for the Mets, Braves, Reds and Orioles. He had 382 hits, 27 home runs and a career average of .263. Nolan won the World Series in 1983 with the Orioles. I mailed to him on March 12 and got him back on March 21 for a 9-day TAT. 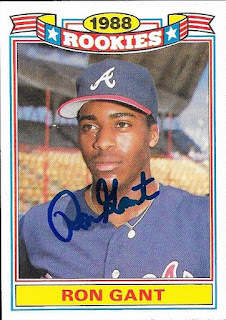 As it stands (even with successes I haven't posted yet), I have 2 signed 1979 Topps; 1 signed 1983; 5 signed 1984 and 7 signed 1985. 1987 is still leading, though, with 12. I got a bunch of TTMs on Monday, March 21. I think it was 5 that day, but it was a ton. I'll start with a guy who signs one-per, and that is Mark Thurmond. 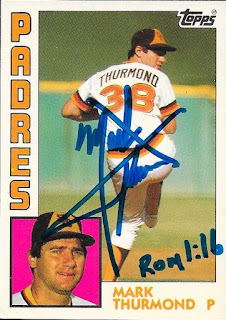 I mailed this 1984 Topps Tiffany to Thurmond on March 12, and got it back signed with a bible verse inscription on March 21. It took 9 days to get it back, which is a pretty nice turnaround. His signature looks really cool, too, almost like a star. I had a ton of Thurmond cards, and it was tough to choose which to send, especially since I had a couple of him as an Oriole, but in the end, the '84 Tiffany won out. I figured, since it was unique to my collection, I should hold onto it in the auto album, instead of relegate it to a dime or nickel box. I think it turned out great. Thurmond (b. 1956) played in the majors from 1983 to 1990 for the Padres, Tigers, Orioles and Giants. He had a career record of 40-46 with an ERA of 3.69 and 320 strike outs. I believe this is his rookie card, if I am not mistaken, so that makes it an even better choice for TTM. Since it is a parallel, I don't count it toward my Topps Autograph Project. 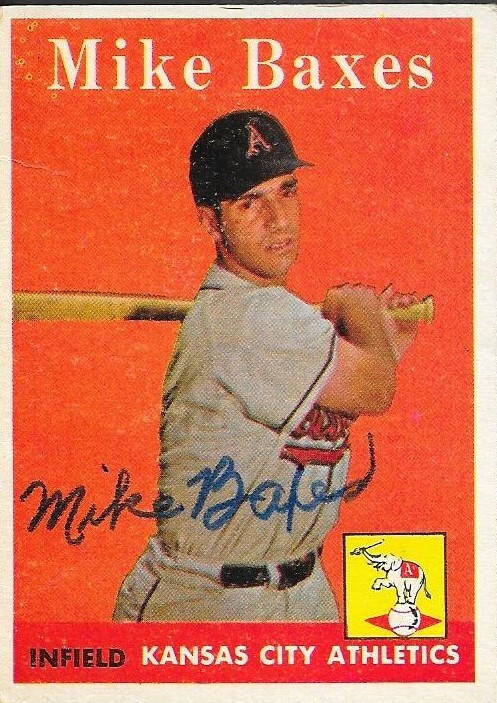 I received a signed 1958 Topps card on Saturday, March 19, from former Kansas City A's player, Mike Baxes. I mailed to him on March 11 and got my card back on March 19 for an 8-day TAT. Baxes (b. 1930) played in the majors in 1956 and 1958 for the Kansas City A's. I really like the old A's logo on the card. That is something I really like about these vintage cards. You get to see the old logos and uniforms of teams; some of them aren't even in existence anymore. Baxes 73 hits, one home run and a .217 batting average in his career. 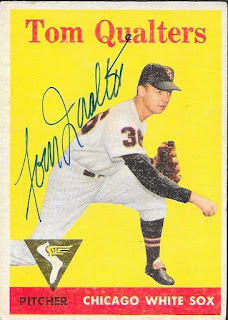 This is the second signed 1958 Topps card that I have. 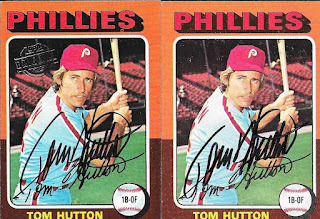 Another of the TTM successes I got back last Saturday was from Tom Hutton. He was actually one of the first that I looked up for TTM, since I had pulled the Topps Buyback card on the left. 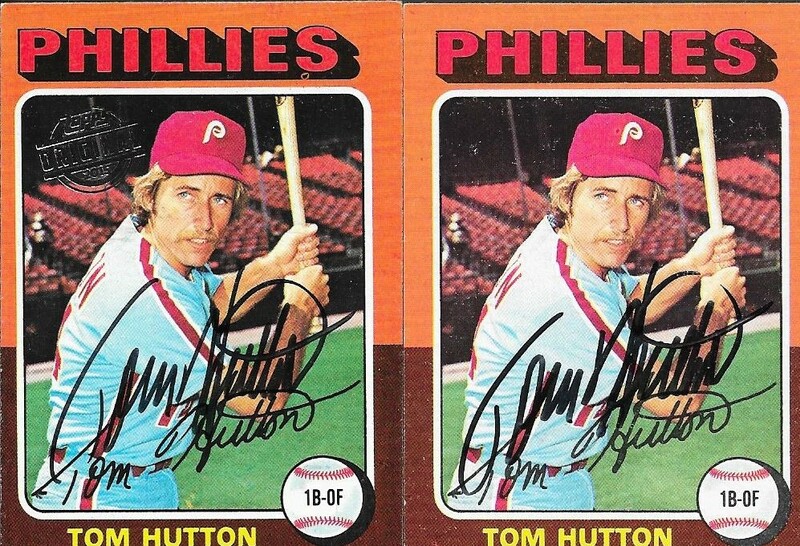 Then, I found the original 1975 on the right in the lot of 75s that Max sent me. I put them aside in my little "to be TTMed" box and finally mailed to him on March 2. 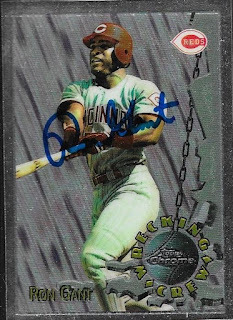 I used to really dislike the buyback cards, and the dumb stamp that Topps puts on them, but now that I am doing this TTM stuff, they really come in handy. I was glad I had another of his cards, as well, because he has a really cool signature. Hutton (b. 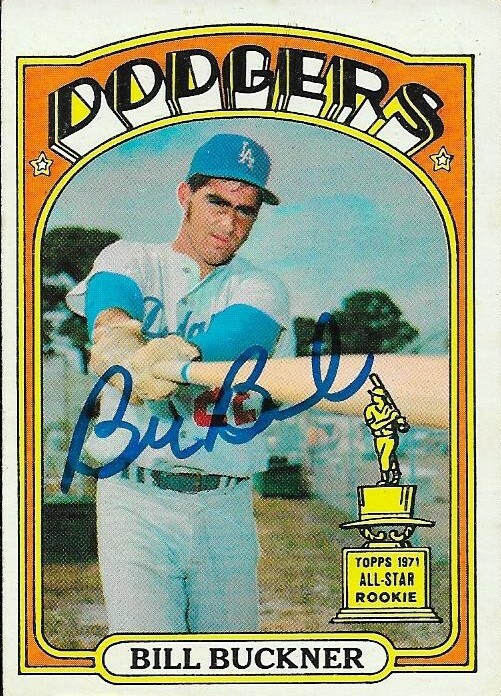 1946) played in the majors from 1966, 1969 and 1972 to 1981 for the Dodgers, Phillies, Blue Jays and Expos. He had 410 hits, 22 home runs and a lifetime average of .248. I got both of the cards I sent back, signed, with a 17-day TAT. I now have (I'm not counting doubles) 4 signed 1975 Topps cards. I got a TTM success last Saturday from former pitcher, Steve Trachsel. I mailed to him on March 7 and got the three cards that I sent, signed, 12 days later. I found a couple of his cards in one of the boxes that Mom gave me, and remembered Max telling me that Trachsel signed TTM. This 1994 Fleer turned out really nice, and with it being his rookie card, was a nice one to send out. I really like how this 1995 Fleer Ultra turned out. It looks really cool, and I am glad I included it. I was torn between a few of the cards I had of him, but I'm happy I chose this to be sent. Finally, I got my first signed 2005 Topps. I like how the blue sharpie blends with the color coordination on the card. I have a couple more 2005s that I intend to send out, but this one looks great. It might be tough to find one that looks better than this one. Trachsel (b. 1970) played in the majors from 1993 to 2008 for the Cubs, Devil Rays, Blue Jays, Mets and Orioles. 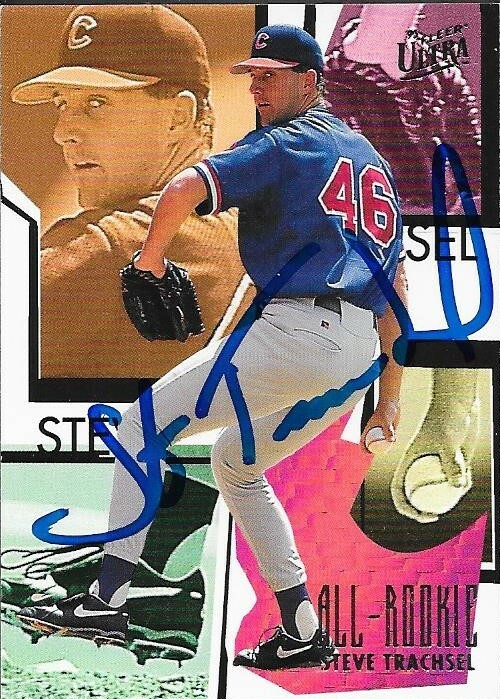 He had a career record of 143-159 with an ERA of 4.39 and 1,591 strike outs. He was 4th in the NL Rookie of the Year voting in 1994 and was an All Star in 1996. 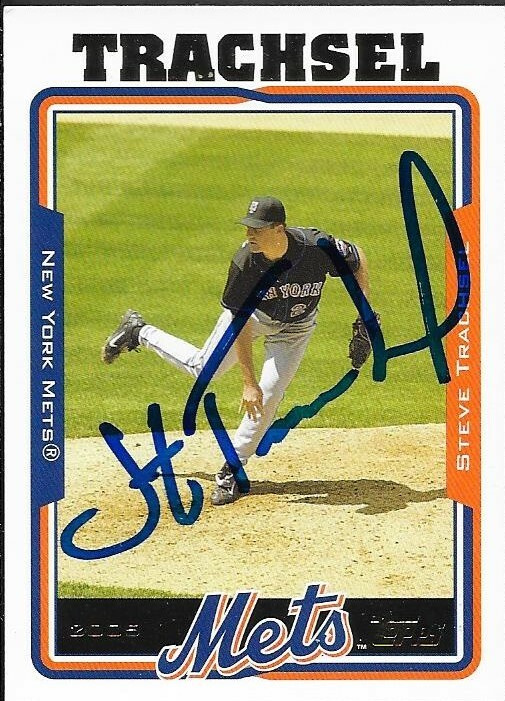 On September 8, 1998, in the bottom of the 4th inning with two outs, Trachsel became the answer to a trivia question. He gave up a home run to Mark McGwire that would break Roger Maris's single season home run record. I received so many TTM successes last week, I'll be playing catch-up for a while. One of the ones I got in on March 19 was from Hal Smith. I sent to him in my initial mailing of vintage cards on March 11 and got them back 8 days later. The 1960 was rough when I sent it, but it still turned out nice. I need to find a few other 1960s to send to other folks so that this isn't my only one. 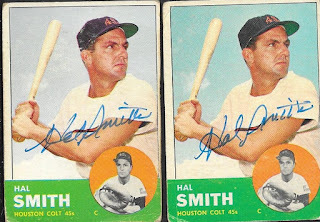 These 1963 Topps turned out great. I found both of them in my box of vintage and figured that since I had two, I would go ahead and send both. I'll probably donate the extra to one of my trading buddies or something. We'll see. Smith (b. 1930) played in the majors from 1955 to 1964 for the Orioles, A's (Kansas City), Pirates, Colt .45s and Reds. He had 715 hits, 58 home runs and a .267 batting average. 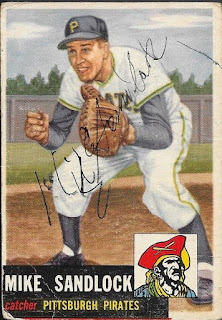 Smith won the World Series in 1960 with the Pirates. I sent out the first batch of vintage cards on March 11, and I am now starting to see some of the cards trickle in. This card was actually the first of that batch to come in, even thought I jumped ahead and posted the Mike Sandlock that came in a couple days later. I had gone through my box of 50s and 60s stuff and thought it would be cool to see some of those signed. None of the guys were stars, so I figured it would be easy to replace the cards when the time came to do the sets. I'm glad I did this. Everything that has come back so far (and there have been a bunch from this batch) has come back looking awesome. I like how Qualters signed this along the line of his back. The thin blue pen he used also made his auto really stand out. Qualters (b. 1935) played in the majors in 1953, 1957 and 1958 for the Phillies and White Sox. He had a record of 0-0 after pitching in only 34 games in his career. His career ERA was 5.64 with 20 strike outs. According to his Wikipedia page, Qualters was signed by the Phillies out of high school as a "bonus baby" for $40,000.00. This means that since he was signed to such a large bonus, he had to remain on the Phillies roster, even at the young age of 18, with no professional baseball experience. Some other notable bonus babies are Brooks Robinson, Al Kaline and Sandy Koufax. Qualters also has the distinction of being the only pitcher to appear on four different Topps baseball cards without ever recording a single win or loss. I mailed to Qualters on March 11 and got this 1958 Topps (my first) back signed on March 18, for a 7-day TAT. 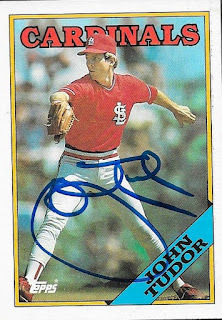 I got a huge TTM success on Friday (March 18) when I got 8 signed cards back from former pitcher, John Tudor. I mailed to him on March 2, and got the cards back with a 16-day TAT. The cards I got signed all contribute to my Topps autograph project, save for two. I just thought they would look cool. The above 1984 Topps has Tudor in a Red Sox uniform and is the 5th signed 1984 Topps that I have. His signature looks really good on this card, I think. 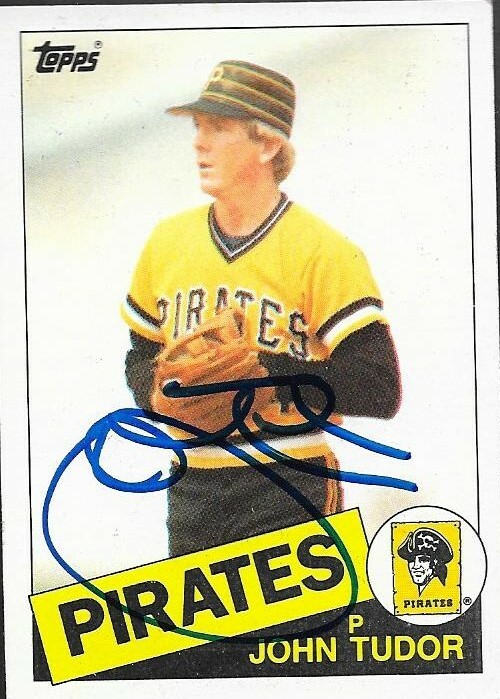 Here we have another old school Pirates uniform, this time on a 1985 Topps. This might be my favorite of the bunch. 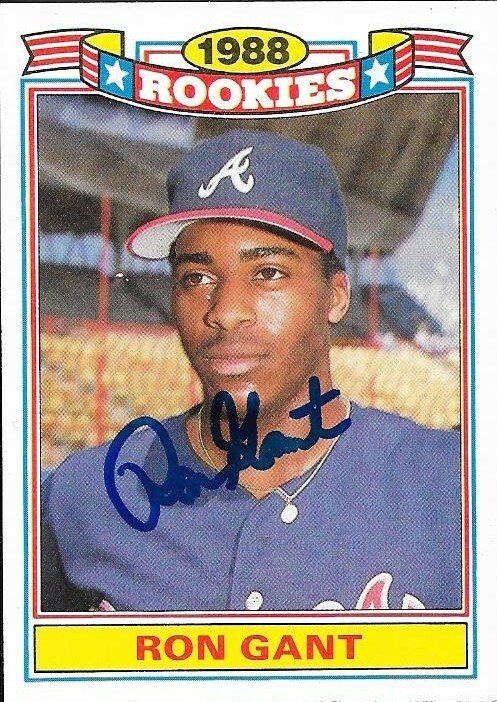 I am finding that 1985 Topps looks really good with a signature. This is the 7th signed 1985 Topps that I have. I'll have a tough time deciding which one will represent this set in my autograph project. Of course, 1986 looks really good, too! The signature that Tudor put on this one really pops. Here is another 1986, this time the All Star version. This, and the one above it make five 1986 Topps that I have that are signed. 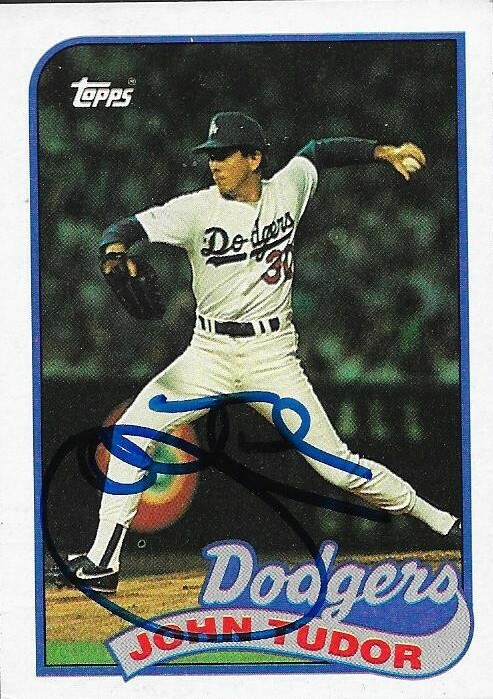 What I once thought was a boring design really comes to life when signed TTM in a blue sharpie. This 1988 Topps really looks good, and surprisingly, is only my third out of a year of Topps that I thought I had coming out of my ears. I think I might have to backtrack on my opinion of this set once I see some more TTMs come out of it. This one looks really sharp. Again, I enjoy the 1989 Topps design. This one didn't turn out as sharply as the others, merely because the backdrop is so dark. It doesn't really take away from the card, but it kind of hides the signature. This is the fifth 1989 Topps that I have that is signed. I included a couple other cards that I thought would look cool signed. This 1986 Topps Mini turned out really nice. I hope to get a few of the Topps Leaders cards signed in the coming TTM successes, but we shall see. Finally, here is a 1986 Fleer that I sent off. Over the course of my collecting career, both as a teen and now as an adult, I have not come across very many 1986 Fleer. I don't really know why. I like the solid blue design. I think it is a really crisp, clean design, and turns out really nice when signed. Tudor (b. 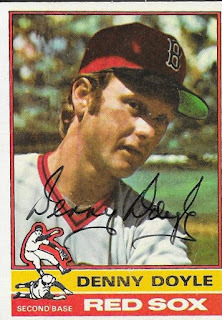 1954) played in the majors from 1979 to 1990 with the Red Sox, Pirates, Cardinals and Dodgers. He had a career record of 117-72 with a 3.12 ERA and 988 strikeouts. He won 21 games in 1985 with 10 shutouts and an ERA of 1.93, but finished second in the Cy Young voting that year to Doc Gooden (he also finished 8th in the NV MVP voting). Tudor won the World Series in 1988 with the Dodgers. 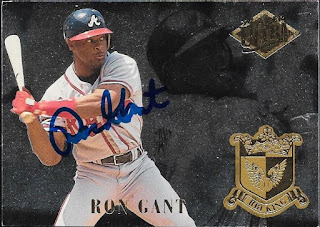 I got a huge TTM success on March 17 (Thursday) with my fourth success of that day, 7 signed cards from former big leaguer, Ron Gant. 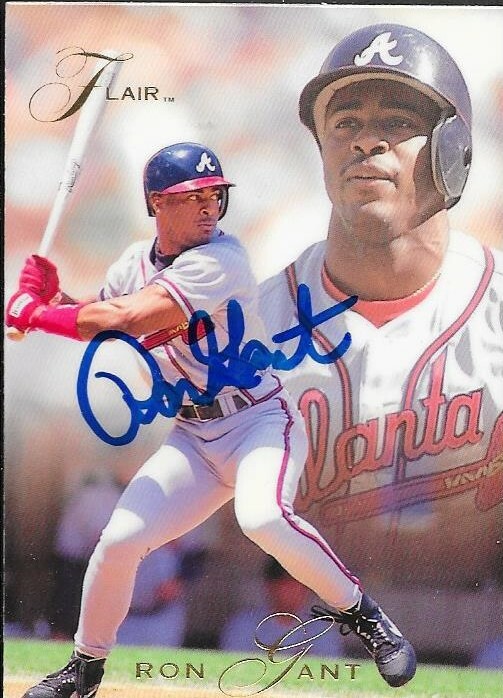 I was able to add my first signed 2002 Topps for my Topps auto project. I had a bunch of cards left over in a box from '02 when I built the set a few years ago, so finding this card was pretty easy. I am in need of bulk cards from the late 90s-early 2000s to make this project work, but overall, I think I am doing pretty well in finding the stuff that I need, so far. This 1989 Topps Rookies Gant was in one of the boxes that Mom gave me. It is kind of funny to see this card beside the 2002 from the tail end of his career. It would be kind of cool to get a couple TTMs from bookend cards, you know, a rookie next to a final year card. I have a lot on my plate at the moment with the Topps auto project, but I think a few side TTM projects would be fun. This 1993 Flair was also in one of the boxes that Mom gave me. Actually, it was in the first of the two batches that she hooked me up with. For a long time, I had been sorting those Flair cards, in hopes of finding a few guys that Max could get signed for me. I only found one Chris Bosio, and Max kept that one for himself, and rightfully so! These cards look so awesome signed. I need to send off some more of the ones I have. Flair was always a great product, and I enjoyed them, especially when they ventured into comic cards. A couple weeks ago, I spent about an hour at my local card shop looking through a huge box of inserts and parallels from the mid-to-late 90s that have been sitting under a shelf for a long time. I found a bunch of guys that I could send TTM to (this was before I decided on the Topps project). I wanted to find a bunch of cool inserts to get signed, and I think I did pretty well. This 1994 FLeer Ultra RBI King card turned out pretty awesome! 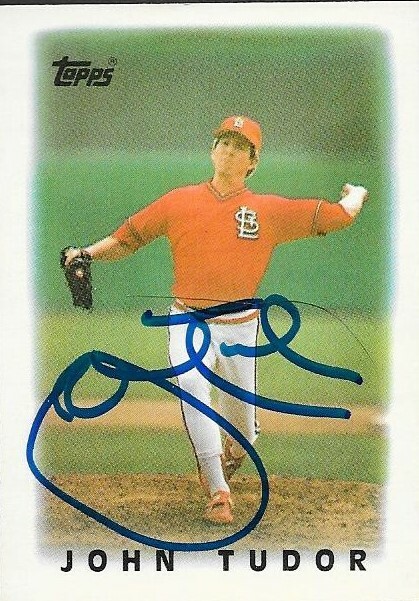 Since I started my TTM craze, I wanted to get one or more Fleer Metal cards signed. I figured they would look cool, and I was right. This 1996 Fleer Metal might be the best looking out of the bunch of cards I got from Gant. This 1995 Topps Chrome turned out really nice, as well, I wasn't sure if the auto would stay, but it turned out great. I'm glad I sent this card along. Finally, here is a 1997 Bowman Chrome. I guess it is a chrome, it is more foil than chrome. The card itself is really cool, and turned out even better when signed. I like the American flag in the background as well. Gant (b, 1965) played in the majors from 1987 to 1993 and 1995 to 2003 for the Braves, Reds, Cardinals, Phillies, Angels, Rockies, A's and Padres. 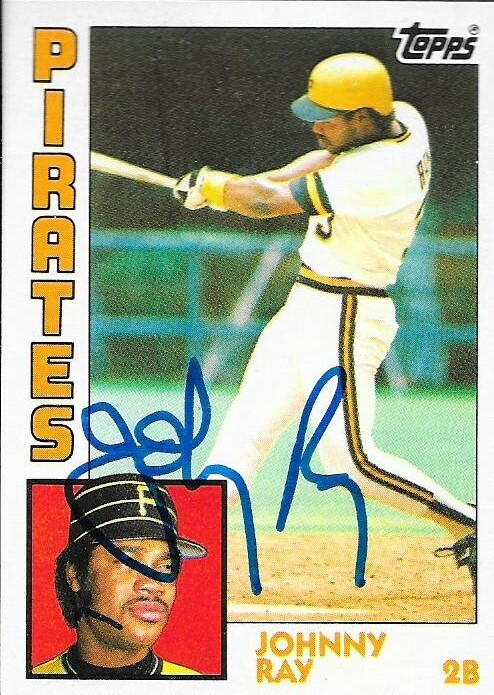 He had 1,651 hits, 321 home runs and a career average of .256. 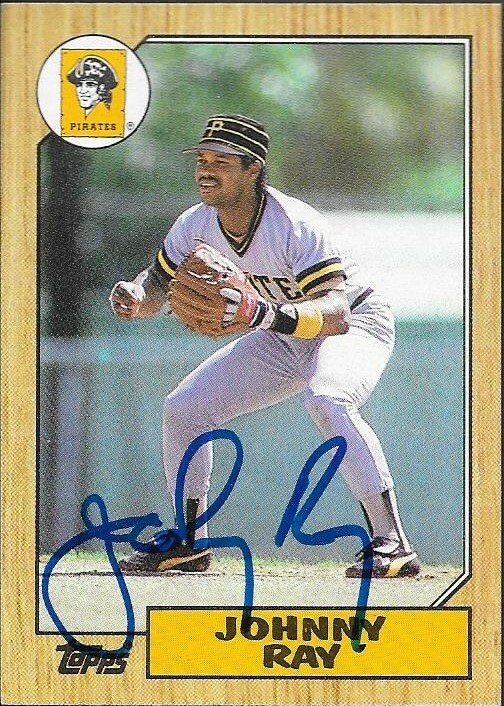 He finished as high as 5th in the NL MVP voting (1993) and was a 2-time All Star. I mailed to Gant on 3/7 and got all 7 of the cards I sent back signed on March 17 for a 10-day TAT. I hope folks who read my blog and follow me on Instagram aren't getting bored with all of the TTM successes that I have had coming in recently. If so, I apologize in advance, because it is about to get crazy. I have sent off a ton of TTMs over the last month, and I intend on continuing this for the foreseeable future. I have enjoyed the repurposing of old cards, and seeing them come back to me signed after being sent out into the world. 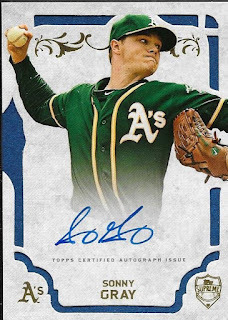 That being said, after receiving a succession of Topps cards signed from some players a few weeks ago, I started thinking about how cool would it be if I could get at least one signed card from every year of Topps. With that in mind, I went to Ebay and picked up a couple 52s, a 51 Red Back, a 51 Blue Back, and a 1955 to add to what I planned on sending out. I kicked off the project by going into my personal vintage collection and finding the above 1953 Topps Mike Sandlock that I picked up a couple years ago after getting his signature on a baseball TTM. The significance of Sandlock doesn't stop at the fact that I had gotten him TTM before, or because I had a 53 Topps of him sitting here available to be sent. His main significance is that he is 100 years old and is still signing TTM. To me, that is amazing. At this moment in time, he is the oldest living former MLB player. That is a really cool accomplishment. 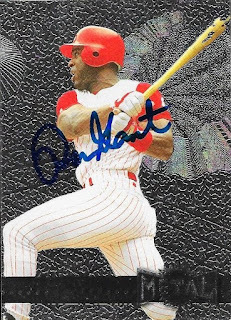 As you can see, his signature is really nice, and looks cool on the 53 Topps. Sandlock (b. 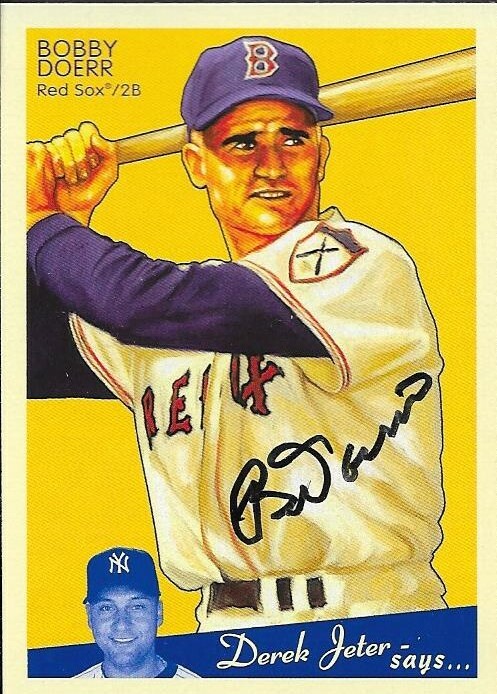 1915) played in the majors from 1942, 1944-46 and 1953 for the Boston Braves, Brooklyn Dodgers and Pittsburgh Pirates. As you can see, two of those teams have relocated since his playing days. When Sandlock was born, Woodrow Wilson was president, the Red Sox had just won the World Series and Ted Williams hadn't even been born yet. 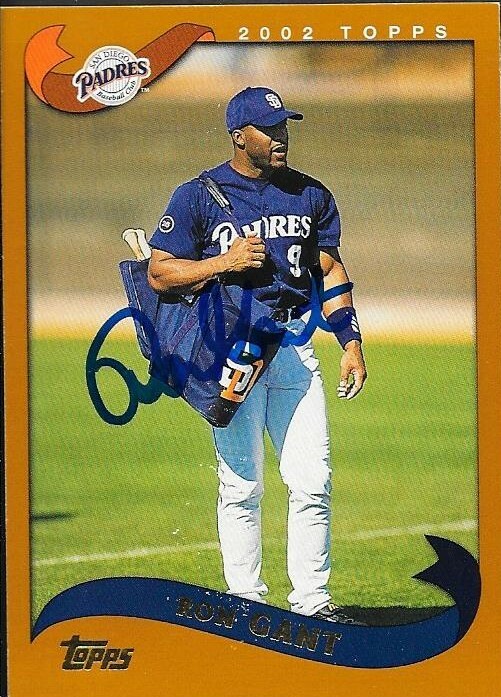 In his career, Sandlock had 107 hits, 2 home runs and a .240 batting average. I mailed to Sandlock on March 11, 2016 and got the card back signed on March 19, 2016, for an 8-day TAT. For my signed Topps project, this is my first signed 1953 Topps card. 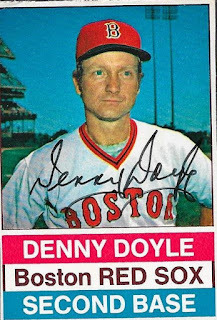 I am missing signed cards from 1951 RB, 1951 BB, 1952, 1954-57, 1961, 1962, 1964-69, 1973, 1974, 1977-79, 1982, 1983, 1994-97, 1999, 2001, 2003, 2004, 2006, 2008, 2009, 2015 and 2016. My goal is to obtain the signed cards by either TTM or IP autos. 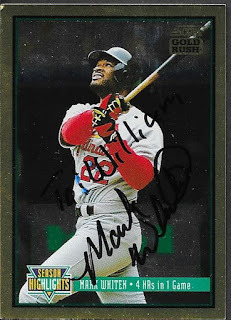 I have accepted a bunch of IP autos from friends like Max, who I send cards to and they get signed. I plan on not buying any signed cards, if I can help it. 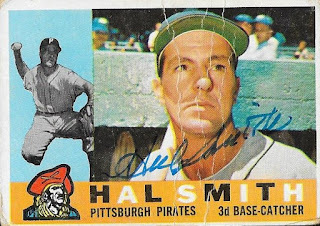 1951 will be tough, but I think I can get one or two from some of the few living players who remain in those sets via TTM. I have a couple pending that I am really excited about. I intend to put the signed cards, in order, in either an album or some kind of display. For years that I have multiples of, I plan on picking the one that I feel looks the best, or has the best story, player, etc to represent that year. 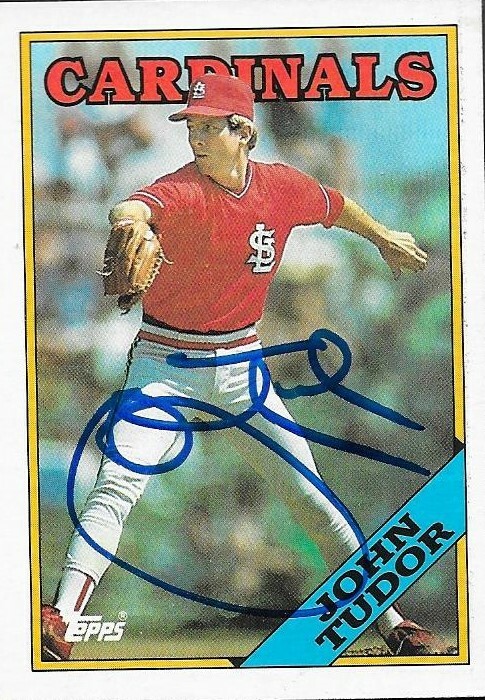 Right now, I have 11 different signed 1987 Topps, the leader among years I have gotten signed. I plan on playing a little game of this in my head as well in seeing which year I have the most of when I finish this project. I also would be interested in seeing other folks' attempts at this same project. 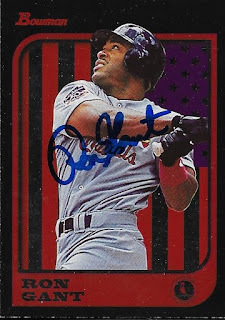 I would like to see which cards that others choose to represent what years, and what years they end up with the most signed cards. I think that would be a lot of fun, and would make for some interesting blogs! I got a bunch of TTM successes on Thursday, March 17, and even more over the weekend, so I need to play catch up, somewhat. Thursday, I got 5 cards back from former big leaguer, Johnny Ray. I mailed to him on March 5 and got the cards back 12 days later. 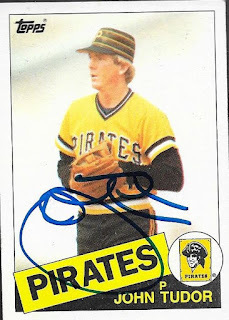 I was really excited to get these cards back, because I loved the old Pirates uniforms shown on the cards. This 1984 Topps turned out great, I think. This 1985 Topps might look the best, though. I love the yellow and black uniform that Ray is wearing. 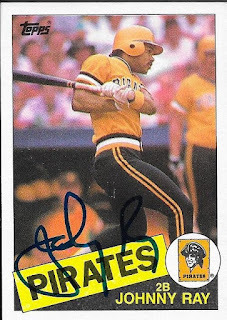 Top is off with the color coordinated 1985 Topps showing the old school Pirates logo, and it really came out nice. This 1986 Topps turned out nice, as well, I think. This has always been an underrated design, and since I have a bunch of them now, thanks to Mom, I plan on adding to the TTM successes with them. I was going to cut myself off with three cards to send out to Ray, but I couldn't send to him and not include a 1987 Topps. I officially have more of these cards than any other year, so it isn't a surprise that I have the most TTM successes on this design. Speaking of Topps designs and TTM successes, stay tuned for my next post, where I will announce the project that I have begun working on. I'm really excited about it! Finally, I had to include this 1986 Donruss Diamond Kings Johnny Ray, as well. 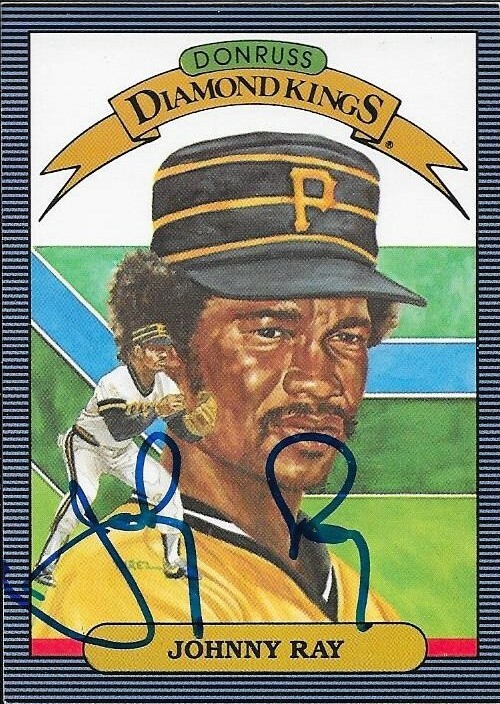 The prominent featuring of the old school Pirates hat is what did it for me with this card. I couldn't not include it. It turned out awesome signed, and I'm glad Ray signed everything I sent to him. Ray (b. 1957) played in the majors from 1981 to 1990 for the Pirates and Angels. He had 1,502 hits, 53 home runs and a career average of .290. He had a really respectable career, when you look back on it. 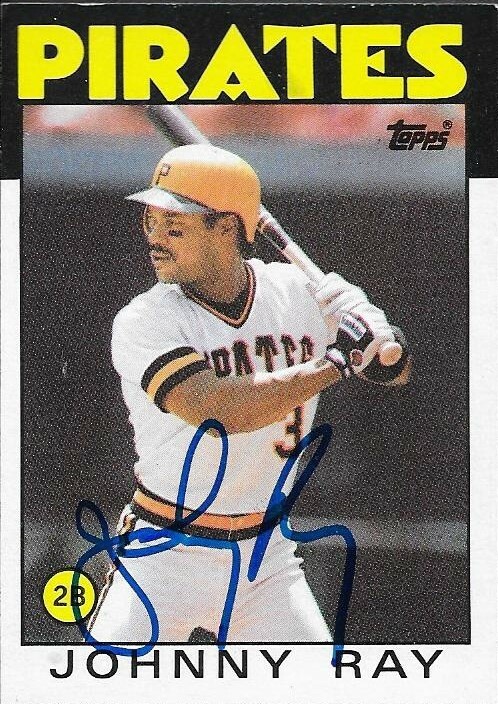 He finished second in the 1982 NL Rookie of the Year voting, 6 overall points less than winner, Steve Sax. Ray was an All Star when with the Angels in 1988. 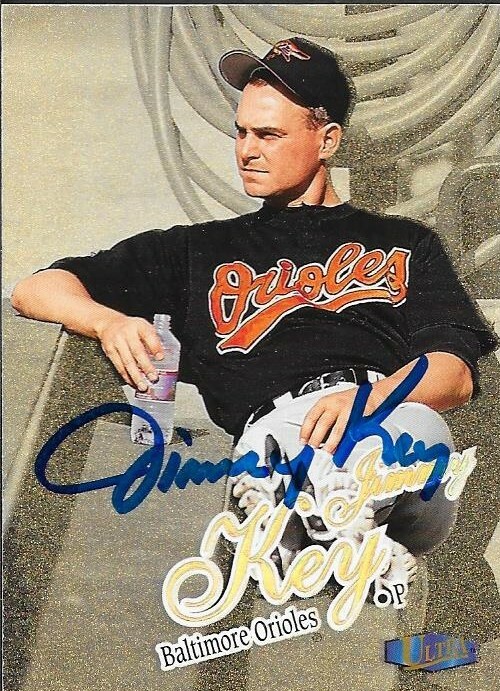 On Thursday (3/17) I got a TTM success from one of my favorite pitchers from when I was a teenager, former Oriole Jimmy Key. Key signs one per, so I sent off the only Oriole card of him that I could find, this 1998 Fleer Ultra Gold Medallion. The card looks great, and I think I did a good job with my choice. Key (b. 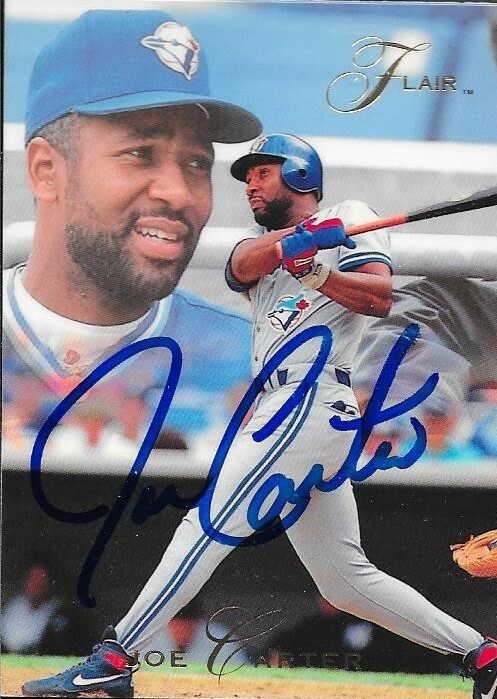 1961) played in the majors from 1984 to 1998 for the Blue Jays, Yankees and Orioles. I didn't realize, but he only played two seasons with the Orioles. It felt like longer. I remember that 1997 O's team he was on was really good, except for some bullpen blunders in the ALCS that year. I had some other personal stuff going on that October, so I don't remember a lot from those playoffs. I do remember them being a really good team, and the pitching rotation of Mussina, Erickson and Key could stack up against pretty much anyone. Key had a career record of 186-117 with a 3.51 ERA and 1,538 strike outs. He finished as high as 2nd in the AL Cy Young voting twice (1987 and 1994) and was a 4-time All Star. He also finished 6th in the AL MVP voting in 1994 when he went 17-4 for the Yankees. Key won the World Series in 1992 with the Blue Jays and in 1996 with the Yankees. I mailed to him on 3/7 and got my card back signed on 3/17 for a 10-day TAT. He is someone that I likely will send to again after a while. I love the signature, and the card looks great. I had an awesome mailday yesterday when I received 4 TTM success in my mailbox. I figured I would have a few massive maildays here and there with all of the TTM requests that I have mailed out recently. I hope you all aren't tired of the TTM posts, because I have really enjoyed sending out my requests and seeing the successes roll in. The first success I will show off from yesterday was Mark Whiten. I only sent him one card, since I saw that he signed one-per. I had a lot of his stuff to choose from, so I went with this 1994 Score Gold Rush that I found in a cigar box full of 1990s cards that my mom gave me for Christmas a few years ago. Essentially, it was her collection that she had given me, since she had stored the cards she pulled in some of the old tin cigar boxes that she rescued from my dad's race shop. The cigar boxes had belonged to my great-grandfather, so getting a couple of those were gifts unto themselves. The Gold Rush card looks really nice, signed. The scan didn't pick the signature up too well, but Whiten inscribed it to me. I mailed to him on 3/5 and got the card back yesterday (3/17) for a 12-day TAT. Whiten (b. 1966) played in the majors from 1990 to 2000 for the Blue Jays, Indians, Cardinals, Red Sox, Phillies, Braves, Mariners and Indians. 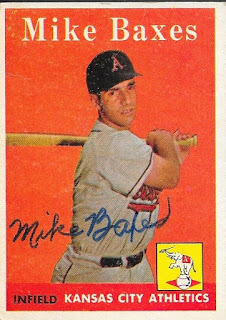 He had 804 hits, 105 home runs (4 of which came in one game, alone, as depicted on the card he signed) and a lifetime average of .259. I got a TTM success on March 15 from 1993 World Series hero, Joe Carter. I mailed three cards to Carter on March 4 with a check for $5.00 and got only one of them signed. Carter returned the other two. I'm not really upset, but it would have been nice if he had signed all three for that fee, but I get it. Different players sign for different rates. The signature looks great. The cards I sent were a 1994 Score Season Highlights card showing his historic home run in the 1993 Series, a 1989 Topps and this 1993 Flair. I imagine that Carter has seen a ton of the 94 Score, so he chose this one to sign instead. It is definitely a good decision, because the card looks great. Carter (b. 1960) played in the majors from 1983 to 1998 for the Indians, Padres, Blue Jays, Orioles and Giants. 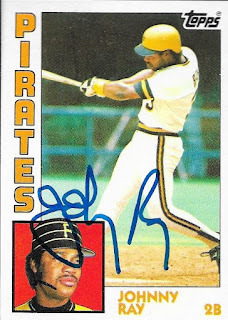 He had a very successful career where he had 2,184 hits, 396 home runs and a .259 lifetime batting average. He finished as high as 3rd in the AL MVP voting (1992), he received MVP votes in 8 seasons, was a 5-time All Star and 2-time Silver Slugger. Carter won the World Series in 1992 and 1993 with the Blue Jays. I sent to him on March 4 and got my card back signed with a $5.00 fee (one signature per $5.00 request) and a 11-day TAT. 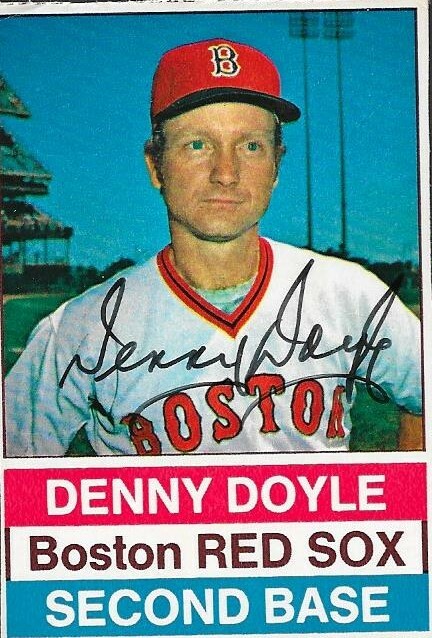 I got a TTM success on Monday (3/14) when I got two cards back from former player, Denny Doyle. I mailed to him on 3/4 and got both cards back in 10 days. Not bad! Doyle has a really cool signature, as you can see above. This 1976 Topps came out of the cards that Max sent me a while back, and was the first 1976 that I have been able to get signed. I think the card looks really good, even though it got creased just a bit in the mail. I also got this 1976 Post card signed. It is pretty badly miscut, but still looks nice with his signature. Doyle (b. 1944) played in the majors from 1970 to 1977 for the Phillies, Angels and Red Sox. He had 823 hits, 16 home runs and .250 lifetime batting average. He finished 23rd in the 1975 AL MVP voting. 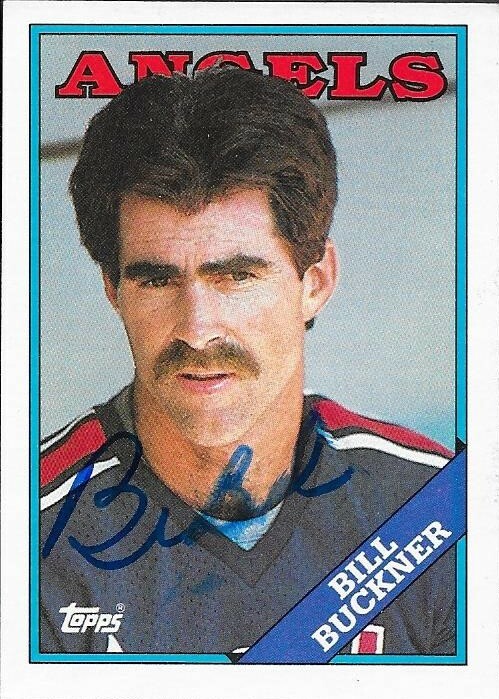 I got a realy cool TTM success on Saturday (3/12) when I received three signed cards from Bill Buckner. I had this 1970 Topps rookie of Buckner floating around in one of my card show boxes for the longest time. When I saw that he was signing TTM, I dug it out of the box and sent it on. As you can see, the signature got smudged in transit back from Buckner, but it is still really cool that the card is signed. It will go into my TTM/IP album, regardless, and that is much better than floating around a dime box. 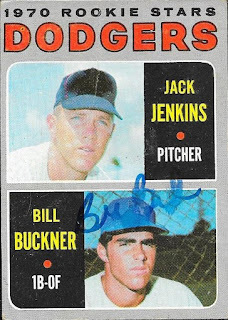 I had this 1972 Topps Buckner in my yet-to-be-started 1972 set. I figured I could replace the card later on, so I grabbed this to send out as well. I'm glad I did, because it looks awesome. 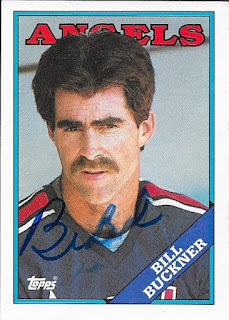 Finally, I found this 1988 Topps of Buckner in one of the boxes that Mom got me, so I sent it, too. Buckner signed all three cards I sent, and I paid a $10.00 fee to get them. I'm disappointed that the '70 and '88 came back smudged, but I really can't argue. I mean, I guess that's a chance you take when sending cards TTM. I mailed to Buckner on February 22 and got the cards back on 3/12, for a 19-day TAT. Buckner (b. 1949) played in the majors from 1969 to 1990 for the Dodgers, Cubs, Red Sox, Angels and Royals. He had 2,715 hits, 174 home runs and a career average of .289. He went to the World Series in 1974 with the Dodgers and 1986 with the Red Sox, but failed to win a championship. He will likely be forever known as the guy who let a ball hit by Mookie Wilson pass through his legs during the 1986 World Series that helped continue the "Curse of the Bambino." 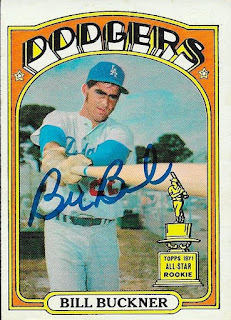 Buckner had a really long career where he finished as high as 10th in the MVP voting (1981 and 1982) and was a one-time All Star (1981). He only appeared on one Hall of Fame ballot (1996) and only mustered 2.1 % of the vote. I got a great deal on Instagram recently when I bought these two autos off of a guy with the screen name of c_breaks. The deal was $16 for both of these cards shipped in a bubble mailer. I got the above 2015 Topps Supreme Sonny Gray auto for my Gray PC. I haven't added a whole lot to it, lately, and I need to organize it soon so I know how many of Gray's relics and autos that I have. The auto is on card and looks really nice. I figured that Topps Supreme would cost a bit more than what I paid, so I do feel like I got a nice deal. 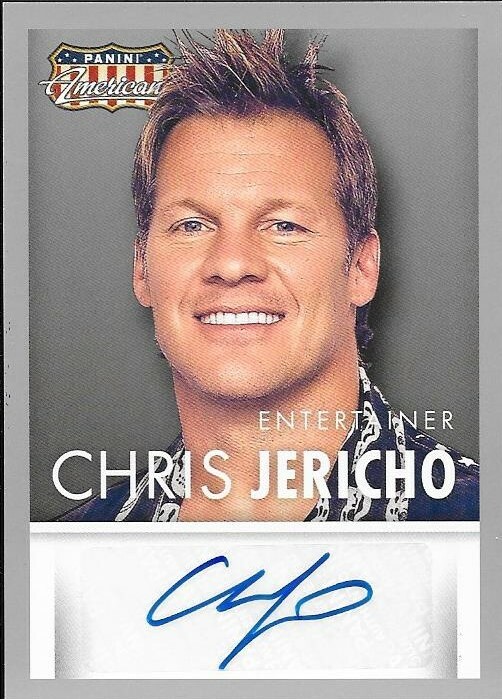 While the Gray was the card I initially saw on his page, when I scrolled down a bit, I saw this Panini Americana auto of WWE wrestler, Chris Jericho. I am certain you all know that I am a Jericho fan. I even named my beloved cat (may he rest in peace) after him. 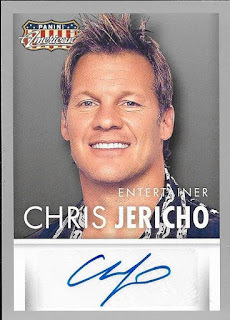 I have Jericho's (the wrestler, not the cat) auto on a book and a baseball, courtesy of my friend, Mike. I had to add this card to my collection, once I saw it. I feel like I got a great deal from c_breaks, so if you are on Instagram, please give him a follow. 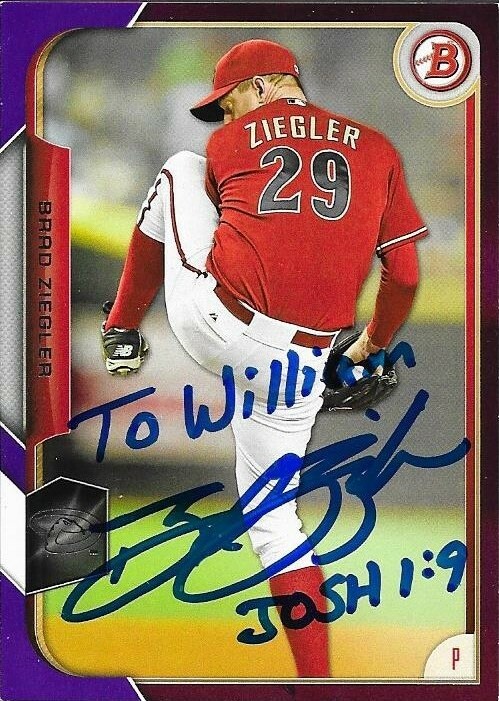 I got another TTM back from Spring Training on Friday when I got this really cool return from Diamondbacks pitcher, Brad Ziegler. I had some nice parallels of him that I wanted to try, so I went ahead and sent them. Ziegler pretty much signed 100%, so I figured sending these parallels would be ok. The above purple parallel from 2015 Bowman turned out great. It is numbered 72/250. I really like the personalization and inscription. The blue sharpie really looks nice. This gold parallel from 2014 Topps turned out nice also. I'm glad I took the chance and sent them on. Ziegler (b. 1979) has played in the majors from 2008 to 2015 for the A's and Diamondbacks. He has a career record of 30-21 with a 2.47 career ERA. He has been one of the better relievers in the game today. 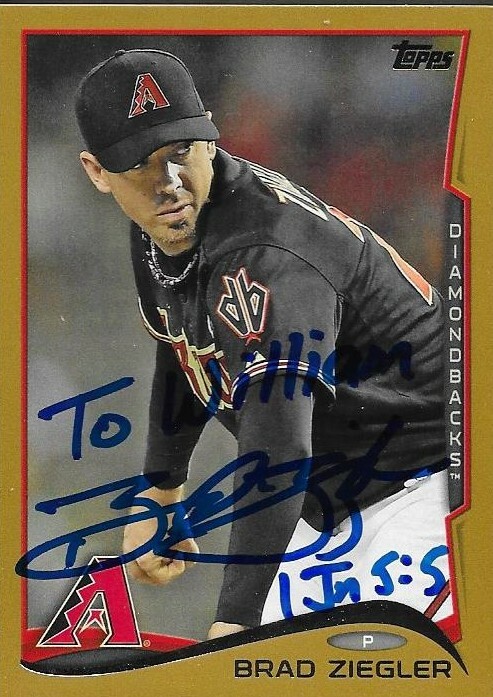 He also saved 30 games for the Diamondbacks last season after transitioning to be their closer. Ziegler is one of the more prolific TTM signers that currently plays in the MLB. I sent to him at Spring Training on February 22 and git the cards back signed on Friday (3/11). This was a 18-day TAT. TTM Success - Eric Young, Jr.